Little Tuffy, Cutie & Sweetie have been with us for just over a month now. 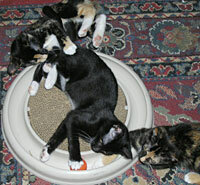 In mid-June they came home with me from the feral spay/neuter clinic. They were almost returned to the wild because their rescuer didn't have time to tame & socialize them. They were very timid & sick with colds. Little by little, they came out of their shells. It was so exciting when they purred for the first time. "Tuffy", the little boy, is a real accomplishment; he was such a tough nut to crack. He was so shy & frightened at first. Now he's affectionate & friendly. He runs over to me now instead of hiding. He likes to cuddle & press his head under my chin & lay close to me. Tuffy has a cute white chin & white paws. He likes to curl up on your lap, cuddle up to your neck & sniff your face. He's a very gentle, sweet fellow. 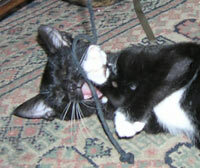 He loves to play with strings, rassle with his sisters & play with other cats' tails. 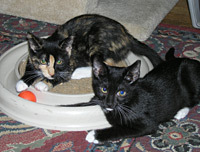 The 2 girls, "Sweetie" & "Cutie", are beautiful calicos with white feet & red-striped noses. They're very out-going & sociable; they fit in with the CR!FR gang right away. They scamper around the place like they own it & especially enjoy napping on hay bales on the porch. Sweetie likes to sprawl across your lap & purrpurrpurr. She loves vigorous face rubs & long body strokes. She loves to chase strings & just about anything else that moves. Cutie loves to play with anything & everything as well. Especially the cords hanging from the ceiling downstairs & kernels of dried dog food. She also likes long body strokes & back-of-the-neck rubs. 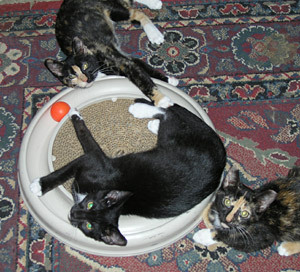 These playful angels are now about 3.5 mos. 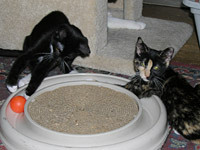 old, healthy, spayed/neutered, box-trained, ok with Max, the dog & are current on their shots. They're extremely sweet & fun to be with. And they're ready to go to their new forever homes! Hopefully Tuffy will be able to stay with one of his sisters. He still needs a little extra reassurance & tlc. It would be good for him to remain with a trusted sibling in his next home, so he doesn't revert to a shy guy in an unfamiliar place. If you'd like to share your life with sweet-natured, strikingly good-looking & playful friends (& give them proper names! ), look no further than Tuffy, Cutie & Sweetie!